This script will create site columns using a .CSV file. This script will be using CSOM to create new site columns in SharePoint Online. We will first create a .CSV file and you can save this to any location. In this post I’ll be using My Documents. 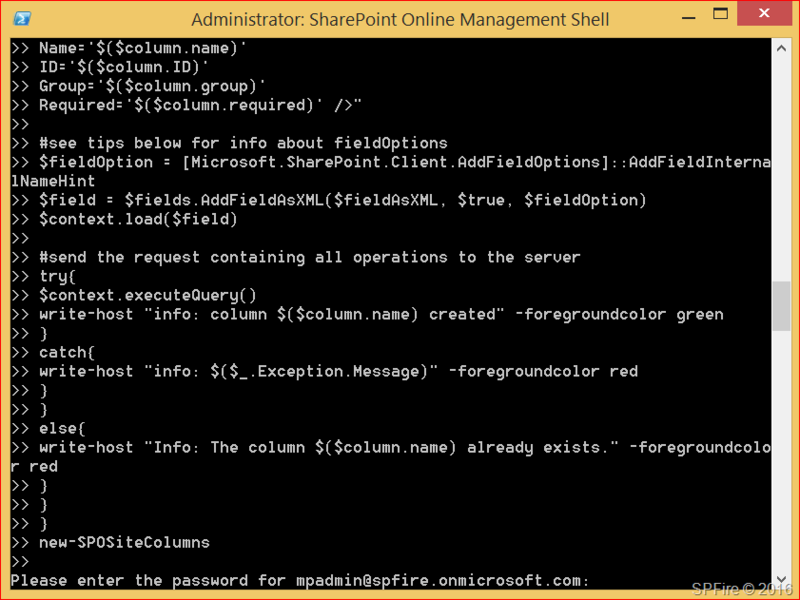 We can now start by opening the SharePoint Online Management Shell as administrator which can be downloaded at https://www.microsoft.com/en-us/download/details.aspx?id=35588. You can verify if the columns have been created successfully by going to site settings and then site columns. Just want to confirm one thing. So If I provide site collection admin credentials, will this gets execute? The script works from the client context. You will need to use an account that has permissions to do the thing you want to do. A site collection administrator can create site columns and should be sufficient. Maarten, can you help me understand where the GUIDs come from? how do I find the correct values on my tenant? The GUIDs in the .CSV file are created using for example https://www.guidgenerator.com/. They are only used to store the columns correctly in the database. We are using the “Name” identifier to add these columns later and not the GUID. Thanks very much for the swift reply. I’m having some trouble getting your site column script to execute and thought that the GUIDs might have something to do with that. I run your script and get an error, ‘Invalid file type’ with no site columns created. Can you please post the csv file that you use and any modifications to the script? I will verify the script tonight. Maarten, no need, I just got it to work! I think it was the way I created the CSV that made it choke. Thanks for your assistance and great script, I will be using this a lot! All fields are created correctly except the List value. Must be something wrong with how I enter that in the CSV. I’ve tried “Lists/[list name]” with and without double quotes, also just “[listname]” with and without double quotes, but in all cases the list lookup field is blank. Can you guide me?